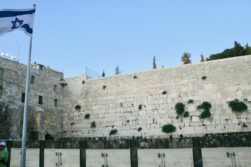 Another nation on Sunday announced plans to move their embassy to Israel to the capital of Jerusalem—Romania—and then backed off that promise on the same day in high profile government disagreement. The eastern European nation currently holds the Presidency in the Council of the European Union, and on Sunday, Romanian Prime Minister Viorica Dăncilă told the pro-Israel AIPAC conference in the United States they were making the embassy change. “I am pleased to announce today to the AIPAC audience that after the conclusion of the analysis by all the constitutional actors involved in the decision-making process in my country and, in full consensus, I as the Prime Minister of Romania and the Government that I lead move the Romanian Embassy to Jerusalem, the capital of Israel,” Dăncilă announced, according to a transcript of her comments posted to the Romanian Prime Minister’s Office website and translated by Google Translate. But just hours after Dăncilă made her statement, Romanian President Klaus Iohannis flatly rejected that any such decision had been made and noted that he has the authority on any final decision on embassy moves, according to a report by Zaire.com and translated by Google Translate. President Iohannis went so far as to call Prime Minister Dăncilă of having “total ignorance in the field of foreign policy” while noting that the issue of moving the embassy to Jerusalem is still under government review. But it wasn’t all bad news for Israel on Sunday.Israeli Prime Minister Benjamin Netanyahu took to Twitter to express his appreciation to Honduras for their decision to take a step towards having an embassy in Jerusalem. 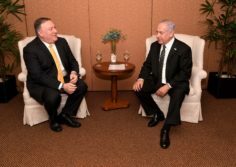 “I thank my friend, the President of Honduras, Juan Hernandez, for his announcement regarding the immediate opening of a diplomatic mission in Jerusalem that will deal with trade, as a first step towards transferring the embassy of Honduras to Jerusalem,” Netanyahu tweeted. 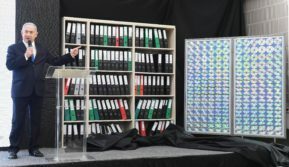 The United States last week levied sanctions on a total of 31 persons and entities for their connections to an Iranian group believed to be a threat capable of re-launching Iran’s nuclear weapons program when the timing was right—and Israeli spycraft helped showcase that risk. The sanctions target those affiliated with Iran’s Organization for Defense Innovation and Research, known in Farsi by the acronym “SPND.” That entity, according to a background briefing from two US Senior Administration Officials published by the State Department, is headed by the founder of Iran’s nuclear weapons program, Mohsen Fakhrizadeh, and controls groups specializing in radiation, explosives, and missiles. Israeli Prime Minister Benjamin Netanyahu, in comments released from his office on Saturday, congratulated US President Donald Trump and other key figures in the US Administration for the sanctions moves, which his office said came in the “wake” of Israel unveiling an Iranian nuclear program archive in 2018. PM Netanyahu with Israeli soldiers. Illustrative. Photo courtesy of Kobi Gideon (Israeli GPO). In the wake of a Palestinian terror spree that murdered a19-year-old Israeli soldier and a rabbi father of 12, Israeli Prime Minister Benjamin Netanyahu made it clear on Monday that the violence would not defeat the Jewish people.” These terrorists will not uproot us from here; the complete opposite will happen. 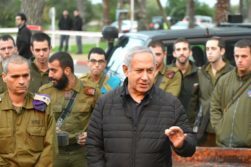 Our response is simple—‘the more they afflict them, the more they multiplied and spread,’” said Netanyahu in comments released by his office, quoting from Exodus 1:12 in the Bible. The comments were timely, as next month is the holiday of Passover, which marks the exodus from Egypt. The Israeli leader also said that he had given the orders to demolish the home of the terrorist who launched the attack that killed IDF Sgt. Gal Keidan and Rabbi Achiad Ettinger and that “preparations” for that response had begun. 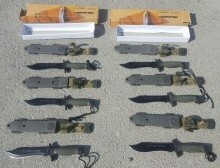 He noted that having identified the terrorist, Israeli security forces were in “close pursuit” as of Monday. Israel knows what Hezbollah is doing in Syria. 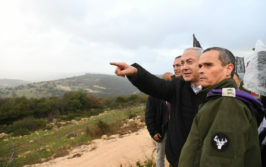 PM Netanyahu in the north of Israel. Illustrative. Just two days after a key United States legislator promised to push for American recognition of the Israeli Golan—citing Israel’s security in his comments—that rationale was highlighted as the IDF exposed a Hezbollah terror network operating on the Syrian side of the Golan next door to Israel. IDF spokesperson Lt. Col. Jonathan Conricus, in a video posted to the IDF Twitter page on Wednesday, noted that not only is Ali Musa Duqduq heading a network in Syria “aimed at striking Israel,” but he’s been an enemy of the US before too—killing their soldiers in Iraq. “For American ears, he has history. He was responsible for the abduction and execution of five American servicemen in Iraq in 2007,” said Conricus in the video, noting that Daqduq served time in prison in Iraq before being released as part of a prisoner swap. The terror network includes Syrians, but is “masterminded by Hezbollah,” according to Conricus.